I was just putting out the supplies for tonight's Crop Night/ Big Shot Club when I realized that I had forgotten to buy a main ingredient for one of the Big Shot club's projects! I needed the treats for the Sweet Treat Cups (#116802). I thought to myself, "No problem, my hubby is out running errands, I'll just ask him to stop and grab some M&M's or Skittles" When I mentioned that they were for a class tonight he thought that this meant we were eating them and not putting them into a card so he proceeded to come home with 2 GIANT bags of M&M's and a GIANT bag of Skittles! Guess what project we're going to be doing for club night next week! The idea of wrecking the card to get into the treats made my skin crawl (LOL) so I decided to add a little door inside the card so that the treats could be accessed easily. All I did was cut the little sticky top flap off a Mini Square Envelope #107309 and slip the 1 3/4 " circle punch #112004 into it to cut out the circle on the front of the envelope. This punch is perfect for making the Sweet Treat Cup hole on a smaller piece of paper! The card was actually done by cutting the card to size and adhering the Basic Black and Cast-a-Spell DSP #115667 to the front and then running it through the Big Shot with the Movers and Shapers Curly Label Die #114506 and the Magnetic Movers and Shapers Holiday Windows #116821. The image that fits perfectly around the treat cup is Sweet Centers #116521. The sentiment from the Teeny Tiny Wishes #115370 stamp set couldn't have been more perfect and it even seemed to have a "spooky" script. Finally I used the 1 1/4" Basic Black Striped Grosgrain #115615 to finish off the top of the card. Stampin' Up Announces the Clearance Rack! I had so much fun playing with the Simply Sent Cards Elements and More Thanks x2 card kit (#114594) the other night! I needed some QUICK thank you cards and this little kit was the perfect solution. I was able to add a piece of Old Olive cardstock that I punched using my scallop border punch. I just adhered it to the inside of the card so that it just showed under the original whisper white scalloped edge. The kit came with everything else I needed including the Old Olive Stampin' Spot, coordinating stamps, and the Old Olive ribbon. The envelope was finished off using my Big Shot and the Stampin' Up Elegant Bouquet Embossing Folder (#115964). This has become a favourite gift of mine for friends who are new to stamping. It comes complete with everything they need to create their own cards and a storage case to keep it all together! My New Rapid Rewards Program is Here! The past year has been an amazing experience for me and there are so many of you out there who I owe for that experience. I have made many friends, both local and long distance You have all supported my business in so many ways. As my thank you to you I have added a new Rapid Rewards Program! For every order of $50+, you will receive a stamp on your Rewards Card. This will be tracked by me, but you are welcome to follow along or check your status at any time:) Once you have collected ten Rapid Rewards stamps on your card, you may select ANY stamp set of your choice from the current catalogue or mini catalogue valued at $50 or less. *Online orders in the month of September will receive double the Rapid Rewards stamps so don't miss out on this fabulous opportunity. Just click on my shopping cart to get started! I'm sorry if my posting has slacked off a little this week. I'm adjusting to back to school. I know that everyone else did that a few weeks ago, but with being at Founder's Circle a couple of weeks ago I missed the first week that included school and all of the boys activities. Now that I've done it for a week I've realized just how good I'm going to have to be with my time for the next few months. Check back tomorrow for my new Rewards Program along with a fabulous project that I've been working on to go with it! Well, I've done my draw for all of you who were kind enough to leave me comments and join my followers group in that few days that I was away in St. George Utah. Thanks so much! I will admit that it is those comments that inspire me to sit down and create as it is so nice to know that someone is out there looking. 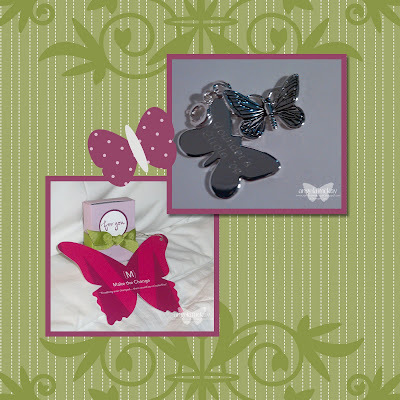 The winner is joined my followers group with dragonfly in her name... could you please contact me with your mailing info? This Christmas card was done using the extremely popular Stampin' Up Dasher stamp set (#116816) along with the Mistletoe Ribbon Originals (#116792) and the gorgeous Christmas Cocoa Specialty paper (#116770). This new flocked DSP is absolutely amazing! I love having texture on my cards! This is one of the cards that people participating in my September 28th Christmas Stamp-a-Stack(now full) had the option of choosing. My second Christmas Stamp-a-Stack of the year will be held on October 18th and although I never had the opportunity to advertise for it, there are only two spaces left! If you'd like to be at this evening please contact me ASAP! Come and Make 15 cards for $15! *Organize a class for you and your friends in October/ November or early December and get the Dasher stamp set for free for the hostess! Contact me quickly as my nights are filling up fast! 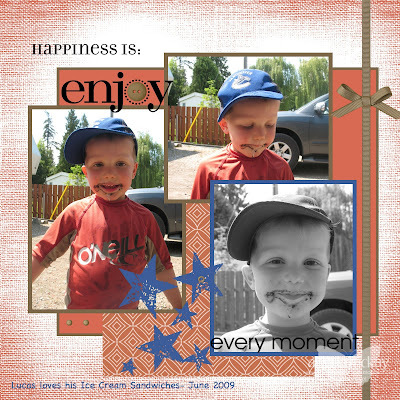 First off, this is a page that I did using Stampin Up's My Digital Studio while on my plane ride home. (yes, it's that easy!) Sorry that it took me so long to post. It seems that I came home with a MAJOR cold and I headed back into my classroom of probably 15 other sick people! While at Founder's Circle I met an amazing new friend...now maybe it has something to do with the fact that we share the same name... but I still think she's amazing:) Here's some photos of Angie Juda (aka Chic' n Scratch) and I at the dinner on the final night. If you are in the United States and looking for an SU demonstrator or team leader, Angie is definitely someone I would recommend! Ordering of SU's new My Digital Scrapbooking starts in just 9 days! I will be placing an order that morning for all my keeners and I've decided to throw in a free package of In Colour Markers for all people who order their My Digital Studio that day! If you choose to order online I will send you out your markers! I am giddy with excitement as I just came to the realization (duh) that I could use My Digital Studio to post some of my pics as Scrapbook pages instead of just a photo. I just killed two birds with one stone as another one of my Founder's Circle scrapbook pages is now ready! This took about 5 minutes to do and that was mostly because I keep playing instead of remaining focused on the the task at hand! 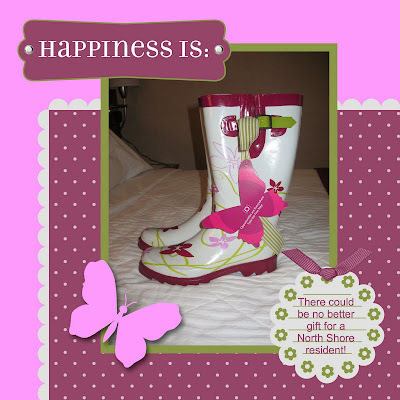 I don't know about everyone else, but where I live in North Vancouver we get a lot of rain in the fall and spring and I have been DYING for a new pair of cool rain boots! My hubby laughed when I email him the photo when I got back to my room lastnight as I think he was relieved to see and end to the rain boot hunt I've been on for the past few months! Another embarrassing Angela moment... when I arrived back in my room to these boots lastnight, I squealed with excitement and ran into the hall where a ton of other women were all screeching with excitement... in my excitement I forgot my room key and felt my stomach drop as I heard the door click behind me:) Typical Angela having to trek down to the front desk in bare feet and pajamas to beg for another room key (I had no ID). *Scroll down to see Tutorial #1! 6. Put the third Vintage Ornament stencil in place and use mask to cover portion of original soft suede ornament that you want to protect. 7.Repeat sponging process using Bermuda Bay ink. 8. Finish off top of ornament with Soft Suede sponge dauber. 9. I used the Soft Suede In Color Marker to draw in the strings for the ornaments. 10.The Berry Merry stamp set was used to stamp the image on the center ornament (Soft Suede and Rich Razzleberry), and on the Bermuda Bay ornament (Encore Silver ink pad). 11. The flourish on the Rich Razzleberry ornament was done using a stencil again along with a sponge dauber and the Encore Silver Ink Pad. 12. The clear rhinestone brad was used for the center of the Bermuda Bay ornament. 13. Stamp Merry Christmas sentiment using Soft Suede ink and the Christmas Greetings Stamp set. Hope that this helps out a little...I'm now practicing some video tutorial so watch for them soon! I started off by sponging the Soft Suede Ink onto Kraft cardstock using a Sponge. I did attempt using sponge daubers, but the circles were obvious. I found that the best technique was to using a circular motion to rub the ink over the stencil. It gave the smoothest image. When I was finished sponging the ink into the main part of the image, I used a sponge dauber to put much heavier ink into the hanging part. Next, I created a mask in the shape of the center ornament by simply tracing it onto a piece of cardboard and cutting it out. Place the stencil down where you'd like your second image to go and then cover up the portion of the first image with the mask that you'd like to protect. Sponge on the Rich Razzleberry ink using the same method as mentioned before and finishing it off by using the Soft Suede sponge dauber for the hook again. In Shelli's apartment... can life get any better??? These photos were taken today at the Kanab Facility. Shelli has an apartment over top of the factory. It is just as classy and tastefully put together as Shelli always is. This apartment is used by Shelli and other employees from Salt Lake City when they are visiting the factory. One neat thing that I wanted to point out is the headboard on the bed... in all of the bedrooms the headboards are made out of old doors! The photo of me and the other three girls was taken early this morning at breakfast as we had to be on the bus for 8am. The two hour ride there was a perfect opportunity to catch a little nap, chat with friends and participate in a discussion with Shelli who was on our bus on the way there! Make Sure to Scroll Down... lots of Posts today! Today is just a quiet and relaxing day of Make-n-takes, sitting by the pool, spa treatments, shopping and talking with new friends. Tonight, a quaint little group of 90 of us:) are going out for dinner to the local Olive Garden and then tonight I'm off to the Tuacahn Amphitheatre to see Elton John's and Tim Rice's Aida. Well, here it is! 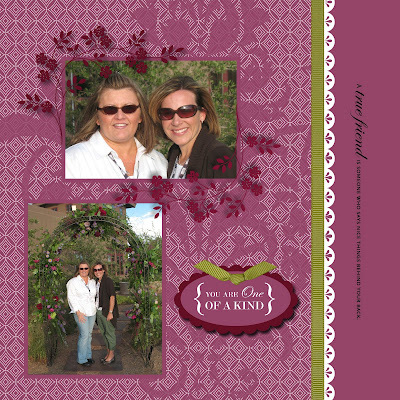 This i s the card that I designed over a month ago for my swap card for Founder's Circle. I decided to make use of something t hat many people don't have alot of experience with, stencils! These are the gorgeous Vintage Ornament Stencils from the current Decor Elements catty! I've got some tutorial photos all set to go for tomorrow so check back! Contact me today to add these to your order or get them free when you sign up to join my West Coast Creators team by September 20th!! Remember that my password to sign up is "scrapaholic"
In celebration of Founder's Circle this week I am offering a special little prize that goes along with the theme! To all of you out there, if you join my Followers List while I'm away, you'll be entered for a chance to win a package of Cottage Wall DSP... for those of you who are already following make sure to leave a comment and I'll add you to the draw as well! Put a link up to my blog via your blog and I'll enter you an extra time, just make sure to let me know that you've linked by leaving a comment:) I can't wait to share with you this week! I had so much fun creating this page tonight while sitting on the couch with my hubby. I love the fact that I was able to pull some of the colours (Dusty Durango) out of Lucas' swim shirt and turn it into a page. I don't feel obligated to use the Designer Pages (pre-designed pages that you just slide your photos into) although I'm sure that there will be many occasions for those too. I've got plans to take many photos this Christmas for one:) I was able to crop all of my photos once they were on the page in a matter of seconds. The layering is a breeze and you can easily move a piece of DSP either back or forward as many layers as you want. I was able to add the stitching on the right hand side by just ckicking on embellishments... and I didn't even need to thread the sewing machine! (now if only hemming my pants were that easy:) The matting that I had to figure out the other night had a much simpler way than I first realized. I didn't notice the little "mat" icon and I was trying to create pieces of cardstock that were just slightly larger than my photos. I LOVE THIS, and can't wait to see the finished product when my first book (or twenty:) arrive! Okay Seriously... Stretching Hodgepodge Hardware! You know things are way too cool when you can stretch the Hodgepodge Hardware to fit your Define Your Life Definitions! I am SOOOOOOOOOOO in love with this program. As a demo we get a fabulous discount on having our books/ pages printed before Sept. 30th so I am madly working on my pages (22 minimum in a book) so that I can get it in! I remember thinking, "are they crazy, who has time to complete 22 pages before Sept 30th?" but this is so easy that I am well on my way! I'm almost tempted to do a few different books as it would be nice to remove some items off of my "to be scrapbooked" list which now seems to be more like a novel after years of neglect! I have an order going in on October 1st so if you'd like your copy ASAP call/ email me and have your name added to the order! Better yet, if you'd like to join my team of fabulous West Coast Creators, contact me today and we can preorder your MDS so it is shipped immediately and get you in on the fabulous offer to print your books at a great discount! August Stamp Set Give-a-way Winner! The Continued Wonder of Window Sheets! Here's Some of My Girls' Cards! Delightful Decorations Class Available By Mail!